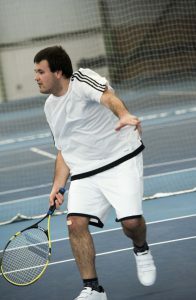 say Jack who plays Visually Impaired Tennis at Nottingham Tennis Centre. I’ve played Visually Impaired Tennis nearly all my life after my Dad searched for a sport we could play together when I was 4 years old and I now regularly compete on the tournament circuit, something that I love, as I get to meet up with the other players, many of who are also now my friends. My last regional competition was on the 15th April at Billesley Indoor Tennis Centre, Birmingham, where I competed in the B3 Category, up against other players from across the Country. For the tournaments nearer home, I tend to travel alone to, but if I’m in London or Newcastle then Dad comes too and we’ll stay overnight. People often ask me how I can hit the ball, but as a Category B3 I do have partial sight, so with the added noise from the bell, it’s not impossible and I also get two bounces before I have to return the ball too, which obviously helps. The Friday night session (6pm – 7pm) at Nottingham Tennis Centre is the only visually impaired one in Nottinghamshire, as far as I know, and the facilities are great. Without it, I’d have to travel much further to train and that probably wouldn’t work for me, as I need to fit it in with studying at Derby University. Other than playing tennis, I love walking and try and keep as fit and active as I can, as having a strong core can help with balance. It’s not just about that though, it’s also about how good exercising makes me feel and competing in the sport I love playing really makes me happy. The Tennis Foundation are working really hard to promote VI Tennis and for the first time this year they’re planning to host three Junior VI Tennis Festivals in 2018. The nearest one is at Loughborough University Tennis Centre. They’re open to children and young people of any ability who are blind or partially sighted and only cost £10.00 per person. There’s also the added benefit that if you’ve not attended before you’ll even get a free racket, so why not join me and starting playing VI Tennis. Recently a fellow student and friend, Vincent Chan, created this video about VI Tennis and I hope it will inspire other people to come along to the Friday night sessions at Nottingham Tennis Centre. 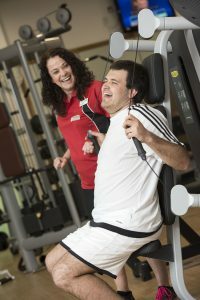 Visit our website for more information about disability discounts and memberships.